This platform has an 8″ by 8″ base, approximately an 8″ ceiling, an open front and partially open sides. 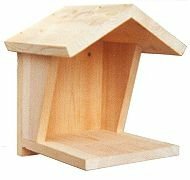 The slightly larger design with gable roof provides extra head room for the larger platform nesters: doves, blue jays and robins. Robins are far more easily attracted to platforms than are mourning doves and blue jays. Mount this platform on the side of a garage or shed over looking both open spaces and foliage in your back yard from seven to fourteen feet high. Carefully select a location that provides a balance of protection from predators, elements, access, visibility, and varying sunlight. Do not mount in a tree. Make sure objects that cats and squirrels can climb do not provide access to the nest. The purpose of a platform is to simulate an isolated cliff edge on a wall face. It’s usually safe from predators and they can survey a wide area from their roost. Sometimes platform nesters like the shelter of a porch roof. If placement is under a roof or eave, try the open platform with no roof. See discussion on platform nesters and individual species pages. Remove the nest after the brood rearing seasons are over. This platform has an 8″ by 8″ base, approximately an 8″ ceiling, an open front and partially open sides. The slightly larger design with gable roof provides extra head room for the larger platform nesters: doves, blue jays and robins. Robins are far more easily attracted to platforms than are mourning doves and blue jays.